I have been using Bookburro for about a year now and am finally able to write a review. 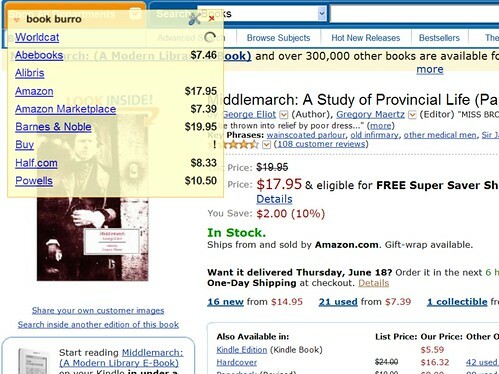 Bookburro is an extension for flock or Firefox that searches multiple bookseller sites to compare prices on the same item. If Amazon has a high price, you can see what Half.com offers as well as eBay, Barnes & Noble, etc. Very convenient. As a librarian, this extension is even cooler because it will search large library catalogs (e.g., Boston Public) and WorldCat while it is searching booksellers. So, have you heard about a great book but you don’t know if your library owns it? Instead of going to an online bookseller to search for the title to get the bibliographic information you then paste into your local library catalog, Bookburro searches WorldCat for you. You click on the WorldCat link and WorldCat displays the libraries closest to you which have the book. If you local one doesn’t have it, you can submit an Interlibrary Loan request if your library uses ILLiad. In a press release yesterday OCLC announced they will start uploading metadata for articles from H. W. Wilson and MLA to the WorldCat.org. This will make it possible for users to find even more resources online at the article level and know which libraries have those resources. Thanks to Robert Melton from UCSD for posting the link on the LES listserv.